Need more information about booking Home 9119112 ? Perfect Sunshine combines the best in European design with a breathtaking Caribbean location. It allows you to indulge yourself in luxury, from the enormous four poster bed in the master bedroom to the 50 foot infinity pool; from the sculptures in the rooms to the modern Italian kitchen; from the bright Caribbean colors in each of the rooms to the 20ft height of the airy reception areas. The villa itself is no less spectacular. Sleeping up to 11 people in ve individually designed bedrooms, Perfect Sunshine is both spacious and elegant. Featuring the best in contemporary design, with an Italian kitchen, Designer’s Guild furniture and high airy wooden ceilings, it will not fail to delight. But you will hardly want to spend all your time inside in such a glorious location! The villa also has a private 50 foot pool, and spacious terracing all around for you to enjoy the views. Antigua itself is a wonderful island, and very easily accessible from the UK with frequent direct flights. With 365 beaches, one for every day of the year, you will not be short of places to explore. Nonsuch Bay (where the villa is located) is famed for its excellent sailing and kitesur ng conditions, and you can take lessons or rent equipment down at the marina. 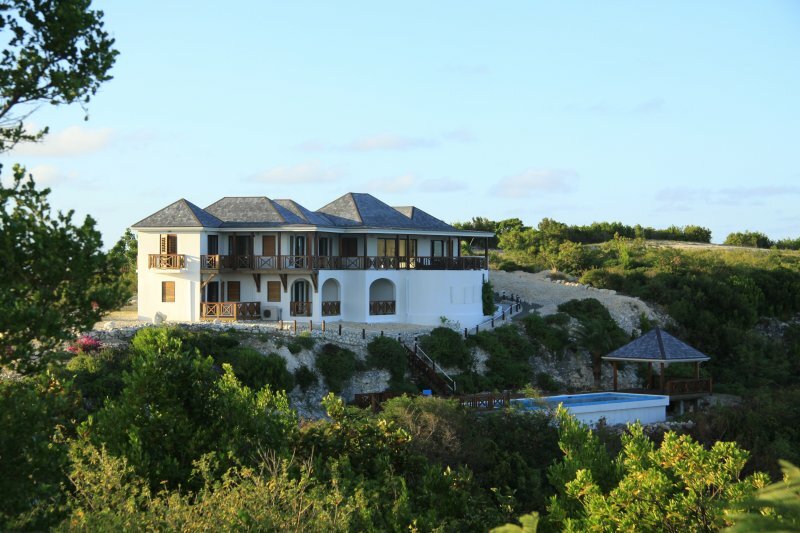 Our location above Nonsuch Bay Resort means we have the best of both worlds: we are within the gated community, and have access to the award-winning restaurant, lovely beach (a 5 minute walk down the hill) and activities provided, but if you are seeking tranquility, you have all you need at the villa itself. You can get in touch with Gillian (the owner) through the contact form on this page. Send Gillian (the owner) an email through the contact form on this page. Alternatively, if there’s a phone number on this page, you can call them. How do I contact Gillian (the owner)? If you’ve already booked, go to Manage your holiday booking to view Gillian the owner's contact details or send them a message. Or send Gillian (the owner) an enquiry through the Contact the owner/manager form if you’d like a quote or more info first. When you pay online through the Book your stay form, a booking request is sent to Gillian (the owner). You’ll find out within 24 hours whether they’ve accepted - no money will leave your account before then. You can also request a quote from Gillian (the owner) through the contact form. The owner will email you the total cost for your dates and a link to book and pay online. Use the Book your stay form to pay provisionally online. You can pay by credit/debit card or PayPal. Gillian (the owner) will have 24 hours to accept the booking and no money will leave your account before then. Why can't I call Gillian (the owner) before booking? You’ll need to contact Gillian (the owner) to do this. Send them a message in Manage your holiday booking or through the contact form on this page. You can request to change the dates or number of people on your booking via the Manage your holiday booking page. To change your holiday dates use the Edit booking button. If you need to change the number of guests staying then send Gillian (the owner) a message. If Gillian (the owner) agrees, they’ll send you a revised quote outlining the changes. You can review and accept/decline this from the Manage your holiday booking page. You’ll have 48 hours to take action before the revised quote expires.